The Russian domesticated red fox is a form of the wild red fox (Vulpes vulpes) which has been domesticated to an extent, under laboratory conditions. They are the result of an experiment which was designed to demonstrate the power of selective breeding to transform species, as described by Charles Darwin in On the Origin of Species. The experiment was purposely designed to replicate the process that had produced dogs from wolves, by recording the changes in foxes, when in each generation only the most tame foxes were allowed to breed. In short order, the descendant foxes became tamer and more dog-like in their behavior. The program was started in 1959 in the Soviet Union by zoologist Dmitry Belyayev and it has been in continuous operation since. Today, the experiment is under the supervision of Lyudmila Trut, in Russia, at the Institute of Cytology and Genetics in Novosibirsk. The experiment was initiated by scientists who were interested in the topic of domestication and the process by which wolves became domesticated dogs. They saw some retention of juvenile traits by adult dogs, both morphological ones, such as skulls that were unusually broad for their length, and behavioral ones, such as whining, barking, and submission. In a time when centralized political control in the fields of genetics and agriculture promoted Lysenkoism as an official state doctrine, Belyayev's commitment to classical genetics had cost him his job as head of the Department of Fur Animal Breeding at the Central Research Laboratory of Fur Breeding in Moscow in 1948. During the 1950s, he continued to conduct genetic research under the guise of studying animal physiology. Belyayev believed that the key factor selected for in the domestication of dogs was not size or fertility, but behavior: specifically, tameability. Since behavior is rooted in biology, selecting for tameness and against aggression means selecting for physiological changes in the systems that govern the body's hormones and neurochemicals. The least domesticated foxes, those that flee from experimenters or bite when stroked or handled, are assigned to Class III. Foxes in Class II let themselves be petted and handled but show no emotionally friendly response to experimenters. Foxes in Class I are friendly toward experimenters, wagging their tails and whining. In the sixth generation bred for tameness we had to add an even higher-scoring category. Members of Class IE, the "domesticated elite", are eager to establish human contact, whimpering to attract attention and sniffing and licking experimenters like dogs. They start displaying this kind of behavior before they are one month old. By the tenth generation, 18 percent of fox pups were elite; by the 20th, the figure had reached 35 percent. Today elite foxes make up 70 to 80 percent of our experimentally selected population. Belyayev and Trut believed that selecting for tameness mimics the natural selection that must have occurred in the ancestral past of dogs, and, more than any other quality, must have determined how well an animal would adapt to life among humans. The project also bred the least-tameable foxes to study social behavior in canids. These foxes avoided human contact as do their wild behavioral phenotypes. Similar research was carried out in Denmark with American mink. Following the demise of the Soviet Union, the project ran into serious financial problems. In 2014, officials stated that the number of foxes was never reduced and is still stable at about 2,000. As of August 2016[update], there are 270 tame vixens and 70 tame males on the farm. In another published study, a system of measuring fox behavior was described that is expected to be useful in QTL mapping to explore the genetic basis of tame and aggressive behavior in foxes. The sculpture "Dmitriy Belyaev and the Domesticated Fox" was built near Institute of Cytology and Genetics (Novosibirsk) the honor of the 100th anniversary of the birth of Dmitry Konstantinovich Belyaev. The tamed fox gives the scientist a paw and wags its tail. Konstantin Zinich, sculptor (Krasnoyarsk) says "The philosophy of touching a fox and a man is approchement, kindness, there is no aggression from the fox – it was wild, and he made it genetically domesticated." Russian domesticated foxes exhibit a variety of coat color mutations, including red, silver (black), platinum, cross, and Georgian white, the lattermost being a color exclusive to the Russian breeding project. A Russian domesticated red fox with Georgian white fur color. A Russian domesticated red fox with classic red fur color. Archaeologists have discovered evidence of fox breeding in the late Iron Age on Orkney off the north coast of Scotland. After the attack of the Vikings in Scotland around 800, the breeding is said to have stopped. ^ a b Darwin, Charles (1859). "1". On the Origin of Species by Means of Natural Selection, or the Preservation of Favoured Races in the Struggle for Life (1963 reprint ed.). Norwalk, Connecticut: Heritage Press. p. 470. ^ a b c d Trut, Lyudmila (1999). "Early Canid Domestication: The Farm-Fox Experiment". American Scientist. 87 (2): 160. doi:10.1511/1999.2.160. Archived from the original on 23 June 2011. ^ a b c d e Trut, Lyudmilla; Dugatkin, Lee Alan (23 March 2017). How to Tame a Fox (and Build a Dog): Visionary Scientists and a Siberian Tale of Jump-Started Evolution (1st ed.). Chicago: University Of Chicago Press. p. 240. ISBN 978-0226444185. ^ "Domestication of foxes and problems of modern animal breeding". www.bionet.nsc.ru. Retrieved 5 July 2016. ^ "Why domesticated foxes are genetically fascinating (and terrible pets)". pbs.org. 2017-03-31. ^ Ratliff, Evan (March 2011). "Animal Domestication: Taming the Wild". National Geographic. p. 2. Archived from the original on 22 November 2015. ^ "Why domesticated foxes are genetically fascinating (and terrible pets)". PBS NewsHour. 2017-03-31. Retrieved 2018-10-18. ^ Adams, Jill U. (2008). "Genetics of Dog Breeding". Nature Education. 1 (1). Archived from the original on 19 October 2008. ^ Lantzas, Katie (2018). "Gone to the dogs". Distillations. 4 (2): 44–47. Retrieved November 26, 2018. ^ Goldman, Jason G. (September 6, 2010). "Man's new best friend? A forgotten Russian experiment in fox domestication". Scientific American Guest Blog. Retrieved 26 November 2018. ^ Trut, Lyudmila N.; Oskina, Irina N.; Kharlamova, Anastasiya V. (2012). "Experimental Studies of Early Canid Domestication". In Ostrander, Elaine A.; Ruvinsky, Anatoly (eds.). Genetics of the Dog (2nd ed.). CAB International. pp. 12–37. ISBN 9781845939410. Retrieved 12 January 2016. ^ Price, Edward (2008). Principles and Applications of Domestic Animal Behavior. Cambridge University Press. p. 229. ISBN 9781780640556. Retrieved 7 January 2016. ^ "Конец Эксперимента. Ученые Уничтожают Ручных Лисиц и Норок" [The End of an Experiment: Scientists Kill Domesticated Foxes and Minks]. Smartnews.ru (in Russian). ^ "A Soviet scientist created the only tame foxes in the world". BBBC Earth. 13 September 2016. ^ Kukekova, Anna V.; Trut, L. N.; et al. (2007). 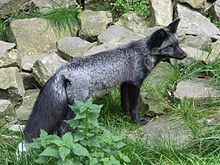 "Measurement of Segregating Behaviors in Experimental Silver Fox Pedigrees". Behavior Genetics. 38 (2): 185–94. doi:10.1007/s10519-007-9180-1. PMC 2374754. PMID 18030612. This page was last edited on 17 March 2019, at 03:00 (UTC).